- LetEncrypt shows you the level of encryption through a security meter. 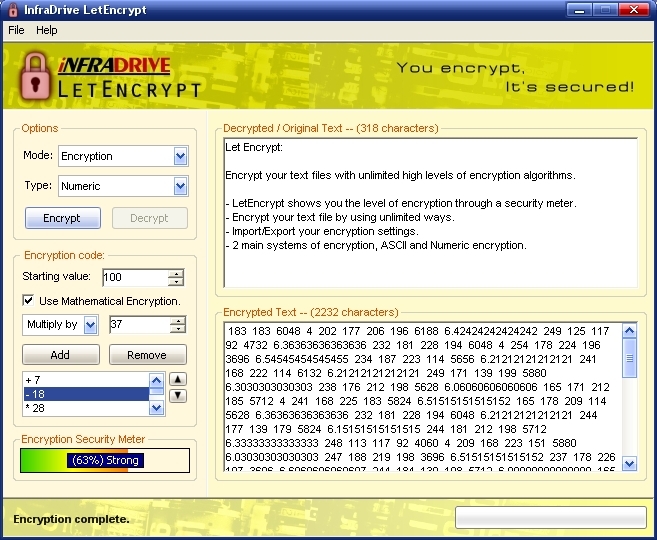 - Encrypt your text file by using unlimited ways. - Import/Export your encryption settings. - 2 main systems of encryption, ASCII and Numeric encryption. - 500MHZ Pentium 3 CPU. - 2MB free space on hard disk. If you found any errors, bugs or you have any ideas or opinions, please contact us at : support@infradrive.com, or you can post it on our online community forum. LetEncrypt is 15 days trial, you can download a fully features copy from our downloads page.